Yoga pants are designed to be worn to yoga or other types of fitness classes. Comfortable and stretchy, yoga pants are usually made from a blend of materials, including some combination of spandex, lycra, polyester, nylon, wool, and/or cotton. A wide variety of styles and fits are available. Yoga leggings are sometimes referred to as yoga tights because of their slim fit. This style is designed to fit snugly, with the material flush to the body from the waist all the way down. With this style, there is no risk of it shifting and getting in the way of movement. This style comes in four different lengths. Exact positioning may vary depending on length of the yogi's legs. Similar to bell bottoms, some flare-leg yoga pants are fitted to the knee, then widen out like a cone from there. Some styles flare around the ankle. These are known as boot cut. The funky edges don't serve a functional purpose, but are an easy way to add a bit of fun to your yoga outfit. Wide leg yoga pants are usually fitted around the waist, hips, and backside, but are completely loose throughout the leg. Sometimes they are loose from top to bottom, with a drawstring at the waist to keep them up. These loose-fitting yoga pants are best for anyone who likes space between fabric and their skin. 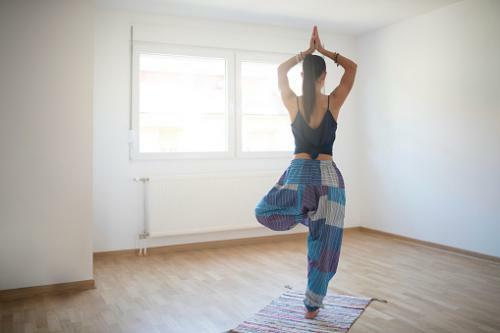 Harem pants are relatively new trend in yoga fashion. They resemble the 90s hip-hop fashion parachute pants, which are fitted at the ankle and waist, but baggy otherwise. The material is lightweight and often thin, so the person wearing the pants stays cool. Yoga shorts are fitted and made out of stretchy fabric. They are often on the shorter end, typically covering only about three to four inches of leg length, max. Shorts that are longer and looser may bunch up or lift away from the leg and expose underwear. For those who feel comfortable enough to wear yoga shorts, they provide an easy way to stay cool during a yoga practice. Yoga pants come in a wide variety of colors and designs, with options ranging from designer styles to budget-friendly basics. The possibilities are endless. From solids to prints to embroidery, cut-outs, and lace, there is something fashionable and fun for every yogi's preference and price range. With yoga pants, there are so many options to choose from. Whichever is your preference in terms of style, make sure that options you choose allow you to feel comfortable and move freely throughout your yoga practice. The best way to explore your options is to head to the nearest athletic wear retailer and try on a few styles. Once you start wearing them, you'll quickly discover plenty of reasons to love yoga pants! You may even find that different styles work for different types of practices.